We accept payment for your cosmetic surgery and other services with cash, cashier’s check, local personal check, Mastercard®, Visa®, and American Express®. We also accept payment through CareCredit®, a finance company that specifically finances medical procedures, particularly those not usually covered by insurance. Our office accepts specific CareCredit® financing plans. Please ask Julie for information about which plans are available. 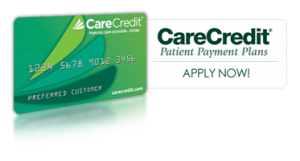 CareCredit® only takes a few minutes to apply and a credit decision is provided quickly.